Recognized for producing high quality natural stone for decades, Limberlost natural stone products are used to create beautiful and functional building and landscape spaces. The unique nature of our 175 acres of resource allows us to produce multiple colours of natural, beautiful, consistent, durable landscape and building stone products. Our dedicated team works year-round to extract, select and produce quality stone materials at an unbeatable value. Our state of the art, 40,000 square foot manufacturing facility produces consistent quality in a lean environment that ensures on-time product delivery. Landscape and building stone is available in the following colours. Limberlost Tan: Consistent light colour, with few imperfections for a modern yet warm impression. Limberlost Brown: Consistent deeper colour than Tan. A compact stone that displays nature’s design of fossils and vegetation. Limberlost Grey: When finished, the grey colour resembles cobalt or slate with nature’s designs showing through. An unfinished version echoes a grey colour Italian Travertine. Limberlost Eramosa: This eramosa is lighter than most of the renowned tiger stripes from the area; nature’s beauty is richly displayed in stripe of this stone or in the swirls and paisleys when fleuri cut. Limberlost Stone produces sawn and natural bed coursing and wall stone in our Tan, Brown, Grey and Eramosa colours for building projects year-round. 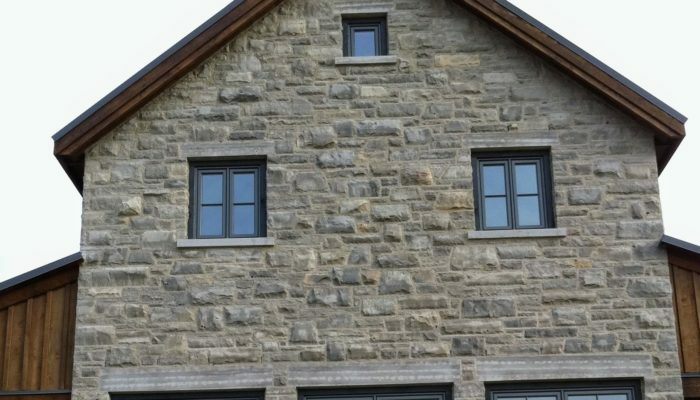 Builders, architects and designers use Limberlost Stone to bring out natural beauty in building structures. 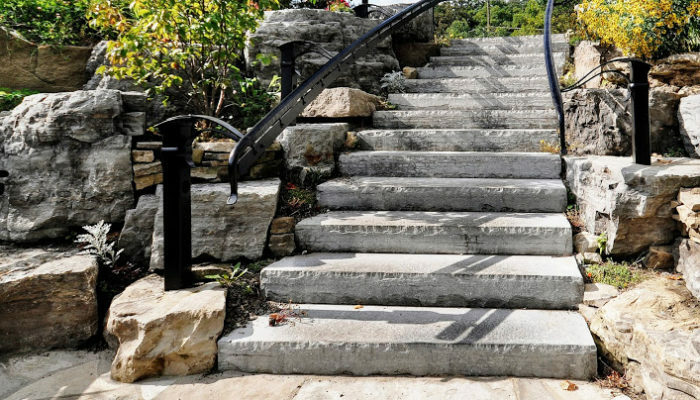 Our landscape stone is produced year-round capturing the unique design of nature’s fossils prominently displayed in our steps, pavers, banding and coping. A variety of products are available to help build inviting and functional outdoor spaces. Looking to maintain high quality stone inventory?